Per a great deal of Hanna-Barbera’s output in the 1970s, the format and writing for Jabberjaw was similar to that for Scooby-Doo, Josie and the Pussycats and Speed Buggy. The show also drew inspiration (in the use of a shark as a character) from the overall shark mania of the 1970s and the then-recent film Jaws. It also shared The Flintstones’ penchant for making use of puns as the names of locations, people, etc., in this case, ocean-themed puns (such as “Aqualaska” instead of Alaska). 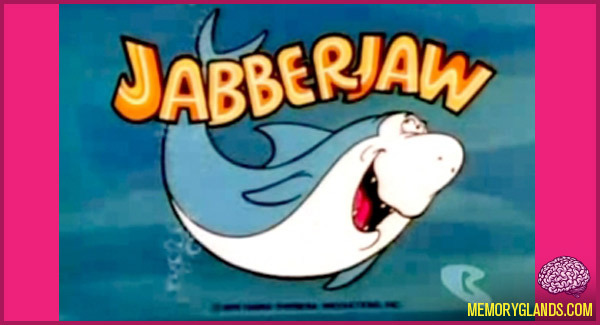 Sixteen 30-minute episodes of Jabberjaw were produced, which aired on ABC Saturday Morning from September 11, 1976 to September 3, 1977 and rebroadcast for a second season of reruns on Sunday Morning from September 11, 1977 to September 3, 1978. In the 1980s, repeats resurfaced on USA network’s Cartoon Express and in the 1990s on Cartoon Network and Boomerang. This is one of a number of shows made before the mid-1980s seen on the Cartoon Network and Boomerang to have been taken from PAL prints.